Generate a full or part invoice for the items on your opportunity. When it’s time to get paid, Current RMS makes it easy to generate an invoice that’s as detailed as you like, for either the total of an opportunity or just a percentage or amount you specify. New to invoicing from Current? Start here: How does invoicing work in Current RMS? 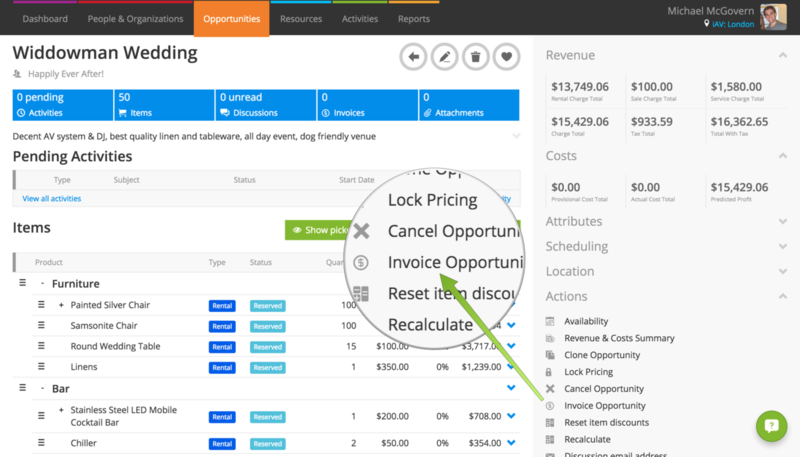 As soon as your opportunity is an order, you can create an invoice for it. Just hit Invoice Opportunity under Actions. This will bring up the “Invoice Opportunity” popup. Don’t see Invoice opportunity? See: Why can’t I invoice my opportunity? Your invoice will look like the opportunity items list, with a line for each opportunity item. Your invoice will be created with lines for each of the groups on your opportunity and the group totals. A line on the invoice is created for each opportunity item’s product group or service type with the total. A simple one-line invoice with the subject of the opportunity and the charge total. Surcharges are included in the charge total of opportunity items, but separate lines are always created for surcharges on invoices.